On all computer cases Iâ€™ve seen, the HD LED is just a single, boring light. Yeah, maybe it comes in blue or purple on your fancier cases, but itâ€™s still just a boring light. I wanted something a bit more flashy and dynamic. For years, Iâ€™ve had a Radio Shack 10 segment LED bargraph floating around in my parts box, since Iâ€™m a nerd, I naturally love blinking LEDs (das blinkenlights), so the LED bargraph HD light idea was born! Winter depression occurs when the body is not exposed to enought light in a day. This is a known phenomena especially in regions on the top of the globe. To combat this there are special light boxes that you can buy and put next to your monitor that will expose you to extra light during half an hour a day, but now new research shows that blue light works better and that it’s more efficient in the early hours of the day. 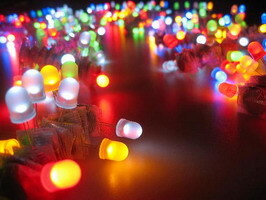 So as high power LED’s are a hot item right now let’s look at a DIY with these beutiful 3w Lumiled’s. Build your own blue LED light box to combat SAD and winter blues. Sleep better and wake up with more energy while exploring the world of high-power LEDs. If 18 watts of LED power isn’t enough to wake you, just add more LEDs! To make your own Printed Cuircuit Boards is something most people never do because it’s just way to many steps that need to be done before you have it ready. That thing with UV lights, rubbing symbols and special papers just puts me off. But here’s an easier way to do it. I’ve read about something similar to this before but this guy has really brought it down to an ‘easy’ level. To wrap it up: With your laser printer print your layout on semi glossy paper. Quickly cut out the etch and place it on the PCB. Iron on the paper for 5 minutes pressing hard. 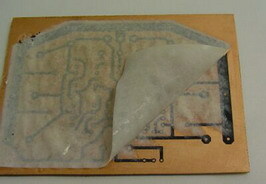 Soak the PCB with the paper in soapy water for 5 minutes. Remove paper and then etch as normal. Wireless is cool, hot and it’s very practical! That’s why I built the bluetooth audio reciever for my car some time back. Another solution is to take a wireless headphone with a separate sender (like a traditional wireless headphone has) and build a (or a pair) wireless speaker which they’ll show you how to do over at Engadget. Did you ever wonder what Mr. X is doing all that time behind his computer in the office? Thought of installing a keylogger but didn’t dare to as it might get detected as spyware? 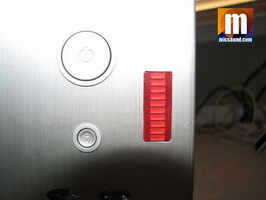 Then you should get a keylogger which plugs in between the keyboard and the computer. As it’s a piece of hardware that only listnens to the traffic from the keyboard it’s undetectable. Try a hardware keylogger instead of a software keyboard logger! This hardware keyboard recorder is system independent, undetectable for software, and installs in seconds (even with the PC off). We present the prototype version of the KeeLogger with full documentation, electrical schematics, and program. 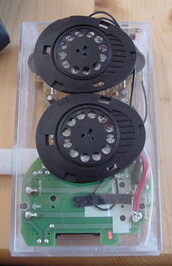 Operation of this device is similar to the KeeLogger Pro version, although download is initiated by a special button. Also the DIY keylogger version logs all data on the PS/2 keyboard line, so memory isn’t used as efficiently as in the commercial version. Ok, a device like that would be nice to buy for a mere $32 – but why not build one yourself? It’s easier then you think as they will show you over at www.keelog.com. You walk over the floor and something grabs you leg. You fall. That’s not that bad… But you also take your laptop with you down. That is bad! Excess cables is a problem that keeps on coming back to haunt you and we all have our solutions to solve it. I usually make a knot on the excess lenght of a cable or I’ll take a piece of velcro. Intruducing another solution: The Cable Bone. It’s simply a piece of plastic cut into the shape of a bone and both you, your wife and your dog will appreciate it. There are very few things in life that get right under my skin, triping over cables is one of them. I think I may have seen a product like this somewhere – not sure, inspriation being the mother of invention and these are fairly easy to make. Wire your home – really! I had this idea some time ago to get a hole bunch of one-wire sensors and wire my house to measure everything that could be measured, but that’s a lot of wires so I never did it. Over at www.bwired.nl they made a reality of this and this is just something you gotta see if statistics over everything! turns you on. Some of the things logged and measured are the telephone calls (including recordings), motion sensors, energy consumption (gas and electricity), water consumption, lights on off. There are also a bunch of live webcams of the surroundings. Take one battery and connect a LED directly to it, add one magnet and wrap it together with some tape and you have a LED Throwie. Accoding to Graffiti Research Lab, that developed this, one of these units will keep on glowing for about a week and with a hole bunch of them you can run downtown and do some electronic graffiti. And yes – they did it and here is a video of it. What you see on the picture is a whole bunch of these throwies stuck together. After all – they’re magnetic. 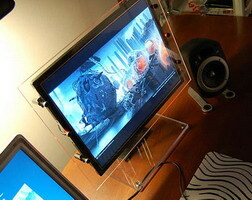 While LCD’s are getting more popular there is still one thing that the cheap ones miss. Design. More like a rule then an exception they’re plain and simple ugly and this is what Antti was faced with when he got his hands on a cheap one to use with his laptop. So what does a true maker do then? Rebuild it of course! I bought an old 15″ tft display from my friend because the display of my laptop didn’t offer enough workspace. This monitor just happened to be too ugly to be tolerated for long. I never had the guts to modify my laptop, so this new screen of mine offered a great opportunity to refresh my building skills. I turned some of my ideas into a 3d model to see how they look. The leading idea was to show the parts of the tft and of course: it shouldn’t be too hard to build. I’ve been a regular user of Skype for about a year now and have been using my own solutions to try to make this as user friendly as possible. But it was never perfect and I’ve always been the only one in my house using it as it hasn’t been user friendly. Then I heard about the Sipura and started looking around on how to use it, and then I heard about VoIPBuster which provided free VoIP calls to land lines all over the world. But – there’s always a but – it wasn’t as easy as I wanted it to be to get everything up running. I eventually figured out how to actually get a user friendly, transparent, phone solution up running and now anyone in my house can pick up any phone and the Sipura takes care of routing the call the cheapest way. In this how-to I will explain why I made the choices I made and show you how easy it can be to have this up running in your own house. Calling nationally and internationally for free to regular telephones.